Following the accusation by Tyler Hamilton on how seven-time Tour de France winner Lance Armstrong used performance-enhancing drugs, there is nothing left to disbelieve. I don't know how murky it will get. I don't know how much vested interest Tyler has in all of this but it surely has dented Armstrong's reputation as someone who could fight a near- fatal disease to come back and score a win over life. In the meantime, I can give you this. 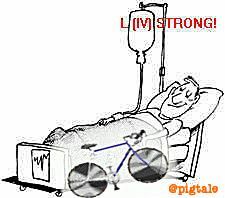 PS: I know that "Livestrong" has a typo but as long as the "IV" is at the right place, you'll get the joke.